← Counselling in Wokingham – Who Am I? Sometimes relationships come to an end – this may not particularly be anyone’s fault, but people or circumstances change and it is best to move on. This can be difficult, especially if one of you wants to continue to work at the relationship, while the other is sure that it is time to end it. When you’ve been in a relationship for a long time, there will nearly always be adjustments that you need to make when the relationship ends. Some things, practical things, are obvious – one of you will probably be finding somewhere else to live; the routines of the week will change – you may have to do some chores that your partner always did; arrangements regarding the kids will be different and probably more complicated; financially things will be different, and so on. Other changes, particularly emotional changes, may be more difficult to predict. You are maybe used to looking out for your partner, trying to help them to be happy, taking a certain amount of responsibility for their wellbeing. Or you may rely on your partner for emotional support, and feel lonely and frightened when they are no longer there. On the other hand, you may experience less anger, fear or unhappiness, so there may be a huge sense of relief for you when you are on your own. The exact nature of the changes will be different for everybody but if you have been in a long-term relationship, it’s likely that you will experience significant emotional upheaval. There will be various people in ours lives who are significant to us – as well as our partner there may be friends, family, colleagues and others, not necessarily all still alive in body, but still alive inside us. It is as if we have miniaturised versions of these people that we carry around inside us, who are able to hold conversations with us. They may encourage us, support us, insult us, criticise us, but whatever they say, their opinions affect us. 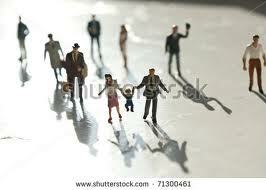 Some of these miniature people are quite small, and only some to mind occasionally. Others are quite big and seem to be with us nearly all the time. 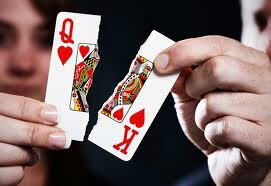 So when a relationship ends, we need to make emotional as well as practical adjustments. Your partner may have left your life forever, but the miniaturised version will still be there, whether you want them to be or not. Over time, that internalised version will become smaller and eventually reach a size that we are comfortable with, that we are at peace with, and then we can truly say that we have “moved on”. I was speaking to a client recently who had a very close relationship with her grandmother. When, many years ago, her grandmother died, she missed her enormously. Now, as she described it, her grandmother is still with her, but not all the time. She sits on a little chair in a corner of my client’s memory most of the time, but when invited, will stand up and come more to the centre of her mind. There she will offer comfort, support or advice before, smiling gently, she resumes her seat in the corner and waits patiently until she is next needed. This entry was posted in Relationships, Uncategorized and tagged change, emotions, feelings, Loss, needs, partner, relationship, support, thoughts, understanding. Bookmark the permalink.